1. The mortality rate for men has converged to that for women. 2. Mortality rates have declined almost monotonically for almost all age groups. 4. ...which is explained, Bloomberg says, by AIDS. 5. If you're between 45 and 54, your odds of dying haven't changed much since 1998--while everyone else's have fallen. 6. DRUGS and suicide explain much of that. 7. 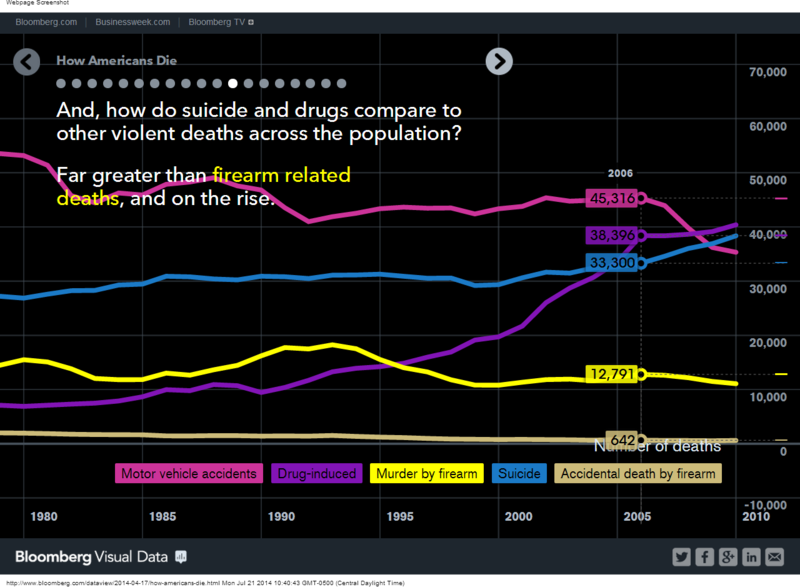 Drugs and suicide now end the lives of a lot more people than before, and have overtaken car accidents as the leading causes of violent death, across all ages. 8. As one would expect, a higher life expectancy comes with a rise of Alzheimer, senility, and dementia as causes of death. 9. What surprised me, though, is that the share of healthcare spending that goes towards nursing and retirement facilities has not increased.